This simple yet powerfully flavored sauce that marinates and coats this mild fish is next level. It brightens the cod fillets and will make for your next enjoyable dinner. Place the cod fillet pieces in small baking dish and season with salt and pepper. Chop the tarragon into tiny pieces. In a small mixing bowl, whisk together the olive oil, lemon juice, Dijon mustard and chopped tarragon. Pour the sauce directly onto the cod pieces, coating them completely. Bake in the preheated oven for 15 to 20 minutes, or until cod is white and flaky in the middle. 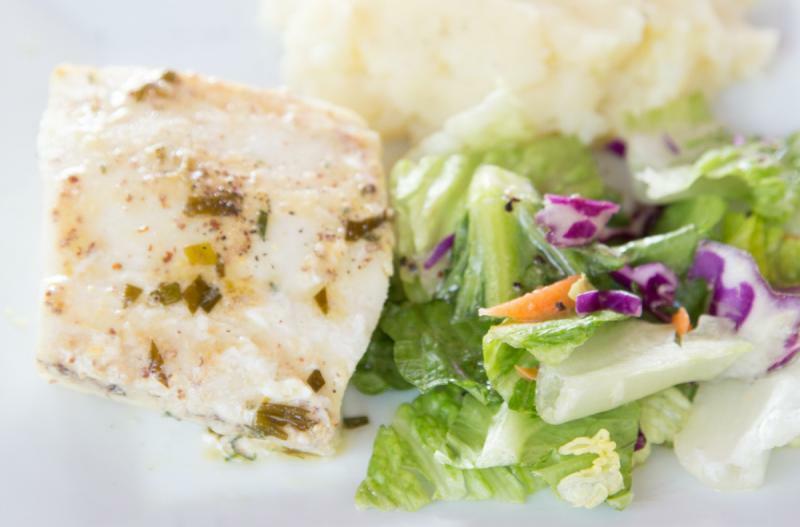 Serve Lemon-Tarragon Cod with salad and rice. Chop 2 Tbsp fresh tarragon into tiny pieces. In a small mixing bowl, whisk together 8 Tbsp olive oil, 8 Tbsp lemon juice, 4 Tbsp Dijon mustard, and 2 Tbsp fresh tarragon. Put baggie in the freezer and freeze up to 6 months in fridge freezer or 12 months in a deep freezer. Thaw in the fridge overnight, or a warm bowl of water for about 20 minutes, before transferring the cod and sauce to baking dish. Bake at 400 F for 15 to 20 minutes. Thaw completely, then bake at 400 F for 15 to 20 minutes, or until cod is white and flaky in the middle.